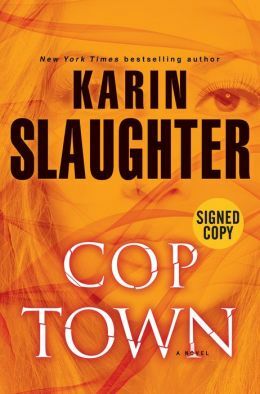 You can’t miss Karin Slaughter’s name in your local bookstore. As the author of more than fifteen crime novels, her extensive catalog takes up a lot of shelf space. But for whatever reason, Slaughter’s name has always been one I’ve skimmed over. There has never been anything deliberate it; one can only read so much. But five star reviews from members of TheReadingRoom community inspired me to check out Slaughter’s 2014 release, COP TOWN, a standalone crime novel set in 1970s Atlanta. I’m glad I did. COP TOWN is a special crime novel. On the one hand, it’s a brutal mystery; a police procedural layered with brilliant characterization. But it’s also much more that. It’s a snapshot of a deplorable time in Atlanta, then one of the most violent cities in America. This is 1974, when the police force consisted primarily of white males, who ticked every box in the negative stereotype form. They were bigoted, racist, and appalled that African Americans had been elected into prominent positions in their local government. They rallied against the cultural changes impacting society: some with greater violence than others. COP TOWN introduces rookie police officer Kate Murphy who, despite her wealth, is determined to make her own way after the death of her husband in Vietnam. There seems little hope for her career at the beginning of the novel; but as the narrative powers forward, she gradually grows into her role, aided by the tough-as-nails Maggie Lawson, who comes from a far less privileged background, and is the niece and nephew of two established and lauded police officers. The narrative is propelled by a serial killer targeting cops, and moves rapidly, with occasional glimpses into the killer’s movements. This is a dark, gritty and violent novel at times – surprisingly so, at times, which works in its favour; these moments have real impact, and live long in the memory. Few crime novels will surpass COP TOWN this year. I couldn’t have asked for a better introduction to Karin Slaughter’s work. All I’m looking for now is more time to delve into her backlist. And my fingers are crossed for the next Murphy / Lawson mystery. There’s legs in these characters for a sequel – maybe a series.